As though she knew it was a big day, on her nine month birthday Surya learned how to pick up a puff from my palm and put it in her mouth on her own. The first few times, she forgot that the drill was insert puff-remove fingers-chew and left her fingers in there for the chewing part. But it’s been a few weeks, and she’s getting the hang of it. We were excited at first, but now I realize she may want to try every dustball and blade of grass that comes her way. Summer is slowly coming to an end. I think it’s actually ended. I had to wear a fall coat the other day, which is a sure sign of something. We squeezed in a few months of fresh farmer’s market vegetables. Broccoli wasn’t at the top of Surya’s list the first time around (not like the velvety eggplants at our local farmer’s market which she inhales), but by the second try it seemed like a winner. I say seemed because I’m learning that everytime I have her “figured” out, she changes. I thought she loved loved loved orzo and zucchini. Same with blueberries. Today, I left for work with a blueberry streak sprayed along my ankle from a spoon that went airborne. And tonight, she communicated clearly with no words that she was not into orzo. Or the daal with squash and mustard seeds that I substituted in. Oh irony of sweet ironies. My child may not like mustard seeds. I hesitate to say that Surya likes Garlicky Broccoli with Parmesan. I will say that Surya likeD the Garlicky Broccoli with Parmesan and may in the future choose to humor her mother by liking it again. Preheat the oven to 350 degrees. 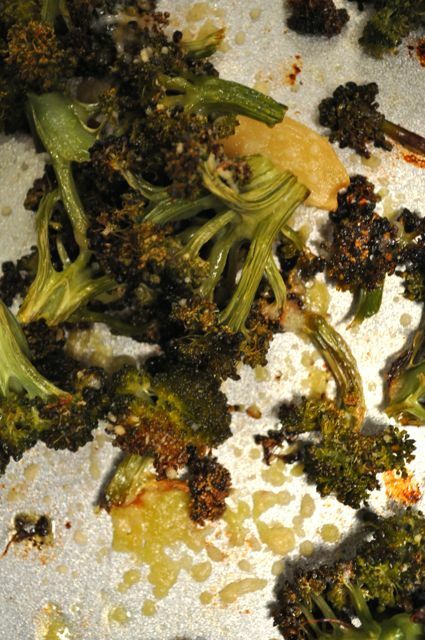 In a large mixing bowl, combine the broccoli florets and garlic. Pour the olive oil over the florets and mix well using a big spoon or your hands. Spread the broccoli and garlic evenly on a cookie tray in a single layer. Roast in the oven for 30-40 minutes until the broccoli becomes a little darkened and the garlic soft. Remove from oven and sprinkle with parmesan cheese. Return to oven for another 5 minutes or so. For Baby: Puree the broccoli and garlic in a food process or your other device of choice with a little water or low sodium vegetable stock. Serve for baby with little stars pasta or orzo. 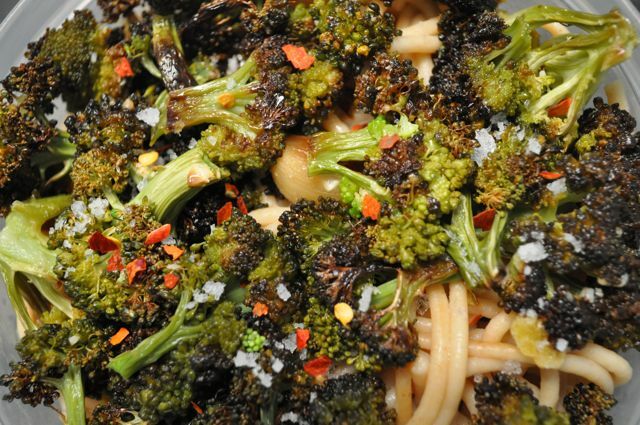 For You: Sprinkle coarse salt and red pepper flakes over the broccoli then top on a mound of whole wheat pasta. For added zing, splash with lemon juice. This made for a fresh, healthy lunch. hehe. I have not experienced this myself yet but my best friend daughter does that all the time. I can imagine what hard work it is to get the little ones to eat. I’m going to direct her to ur site for baby food. I’m sure she will be inspired! The broccoli looks wonderful through your camera. Roasted broccoli with parmesan looks yummy. Guess what we had for dinner- roasted broccoli and cauliflower with anaheim peppers. Babies keep you on your toes, I have concluded they think it is their jobs. Nithya, you are doing SUCH a great job teaching Surya how to eat healthy food. Having a healthy-eating 2 year old, I can say that you should keep doing what you are already doing: keep introducing the same foods periodically, even if she doesn’t always want them.